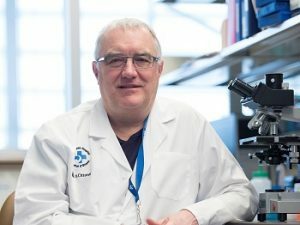 The Ontario Institute of Cancer Research (OICR) has awarded $4 million to a team of researchers working to harness the immune system to attack cancer. Called cancer immunotherapy, this area of research was dubbed “breakthrough of the year” by Science in 2013 and has been growing ever since. It can involve the use of drugs, cells and viruses to target many different kinds of cancer. The grant is one of five new OICR Translational Research Initiatives announced today by Reza Moridi, Ontario’s Minister of Research, Innovation and Science. It is co-led by Dr. John Bell of The Ottawa Hospital and the University of Ottawa and Dr. Marcus Butler of the University Health Network and the University of Toronto. Read the full OHRI news release here. Read the full OICR news release here.